Hello readers! Thanks so much for stopping by today. I recently had the opportunity to introduce the girls to the Sylvanian Families collection, and I was really excited to see what they thought. Sylvanian Families is a toy that’s been around since 1985, so it’s a brand I remember from my own childhood. Sadly, I didn’t own my own set but I definitely wanted to! 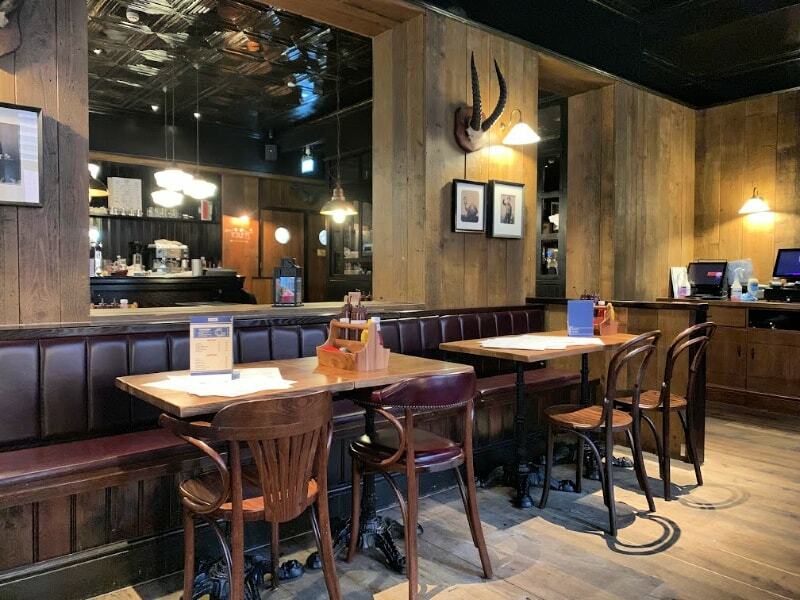 Being able to review the Delicious Restaurant and the Maple Cat Family definitely ticked a box for me, as well as my daughters. When the box arrived, I decided to set it up before the girls got home from school and nursery. I justified my decision by thinking it would be better that they didn’t have to wait for it come out of the box, but really I wanted the chance to take an uninterrupted look at the new toy that had arrived in the house that day. I was sure that once they saw it, I probably wouldn’t get a look in. The great thing about Sylvanian Families is that it doesn’t take long to put a toy like the Delicious Restaurant together. There were just a few stickers to add and a some pieces to put in place to complete the Parisian style building. The small details like the cups and saucers needed removing from their packaging but once that is done, they are ready for some lovely imaginative play. There are no batteries required with this toy which I absolutely love, so once it’s out of the box it’s ready to go. The Maple Cat Family do not require any set up at all and come already dressed in their gorgeous little outfits. You can change their clothes, and unlike some other toys, the girls found it really easy to get them dressed and undressed again. This was a great help as the Delicious Restaurant comes with a chef outfit to help complete the setting. Both the girls fell in love with the Maple Cat family on site. Their cute features, soft fur and outfits definitely won them over. There were a few things we all loved about the Delicious Restaurant. The building itself has so much character, and there’s a few ways to play with it as you can move the furniture and building around depending on how you want to play with it. The attention to detail is excellent and the set comes with a stove, a dining table, menu stand and a trolley. To take the play opportunities to the next level, there is even more detail with a full table setting including knives, forks and spoons, meals, glasses and even a decanter. For the kitchen there are pots, pans and cooking utensils making for a very realistic play setting. To help promote the idea of family gatherings and special occasions there is even a birthday cake to be served for dessert along side the cups and saucers. Doesn’t this sound like one of the best restaurants you’ve ever visited? When the girls arrived home from school they immediately clocked the Sylvanian Families Delicious Restaurant and Maple Cat Family set up in the living room. The dived straight in and started playing with it, and didn’t ask for any tablet time or any other toys that night. In fact getting them to part with it to go to bed was more of a struggle than getting them to switch off their tablets, but in a good way! 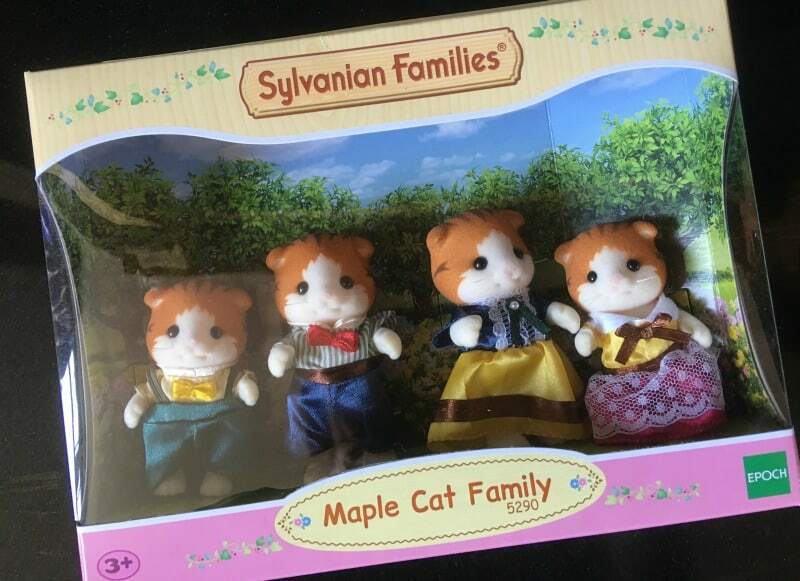 Their new Sylvanian Families play sets have been a part of their play routine ever since, and they want to take the Maple Cat family everywhere with them. They even joined us on our recent glamping trip to Lincolnshire. I can genuinely say we are very impressed with Sylvanian Families, and can see us adding more sets from the Town Series to our collection. 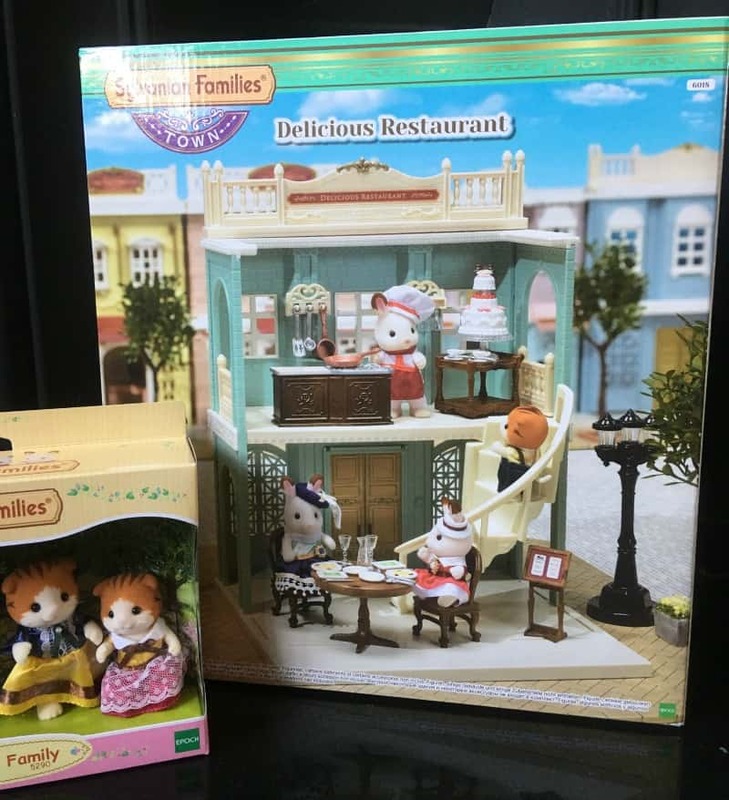 The Sylvanian Families Delicious Restaurant set is available from Smyths Toys currently priced £39.99. I would love to win this for my niece because she loves them but so do I. I have some myself but I would give this set to my niece,Honey. My neice would be overjoyed to add THESE beauties to her collection – im partial to them myself! I’d love to win this prize for my daughter who’s a huge fan of Sylvanian Families. We are a cat-loving family so the children love cat-related toys and games. Anything small that fits in their hands is particularly appealing. I would love to win this prise for my two girls as they collect Sylvanian families! I’d give them to my youngest daughter – she loves cats and would spend ages playing with this family! Our daughter got the Sylvanian lighthouse for Christmas with the rabbit ramily. It’s her favourite inside toy to play with and would love to extend her collection! Sylvanian Families are adorable aren’t they? One of my granddaughters lives overseas and hasn’t seen them, they aren’t around where she lives, so I’d love to give this set to her to introduce her to them. I would love to win for the after school club I work at. The children love the Sylvanian families but we mostly have rabbits so I’m sure they’d love to have some cats! I’d love to win this for my son to give his cousin as a gift. He loves giving presents to people (just like his Mommy) and his cousin loves Sylvanian Families, so it would work out well for everyone. Fingers crossed. This would be perfect for my little niece – she would love the cats! I would love to win this prize for my future children, I loved Sylvanian’s as a child and would love them to enjoy them too. Would love this for my daughters Sylvanian family dolls house. So cute ? my niece would love it ? My daughter collects Sylvanians and Id love to give this to her to add to her collection. She’d be absolutely delighted! I would love to give this to my niece as she’d love these. I love them myself but I know my grandaughter would love them. She had a basket of little dogs and cats and assorted things last time I called and was happily playing with them for ages! I know my niece and my daughter are both loopy over sylvanian families, but who to grace with the gift of this prize? Aw they are brill. My son loves them, he would love this family for his collection. I never had Sylvanian Families when I was little but my cousin did and I always thought they were amazing! I would give them to my friend’s little girl Ruby. My 7 year old is fascinated by cats and is counting the days until she can get her own…..so this cute little family of cats would be perfect for her! Love all the Sylvannians, they are so cute! Amelia loves Sylvannians and cats and I do! I would give this to my friend’s daughter as she started collecting Sylvanian Families last Christmas. I would love to win this for my niece who loves sylvanian families! It would go straight to my niece. She currently has a lot of Tots Town and Happyland toys, which she loves. So I think the Sylvanian Families toys are the perfect next step for her. I would give this to my little cousin so she can add to her collection. I used to play with Sylvanian families all the time as a child, so would love my son to experience them too! My daughter has taken an interest in Sylvanian Families, as her cousin has them, she has asked for some for Xmas. This would be a nice treat for her if I won them. I’ve been collecting Sylvanians since I was 6. So just under 3 decades. They’ve been releasing new ones and I’m so happy that they’ve all been wonderful! I’m trying to build up my collection so that I have something to give my nieces when they’re old enough to play with them! I’ve always loved Sylvanian families as they are so cute & I’d love to win these for my Granddaughter, She loves collecting things. I loved these as a child and am enjoying building on my childhood toys collection with my niece. We could never afford Sylvanian Families when I was younger, but I used to love playing with my friend’s. I’d give them to my goddaughter, but make lots of excuses to come play! I would like to win this for my niece. She loves animals. My grand daughter has just started to collect them, We got her the Rabbit family and she is hooked!> She would absolutely love this!. I’d love to win this for my little one due in a couple of weeks – I had Sylvanian Families as a child and we’re very much a ‘cat’ family! 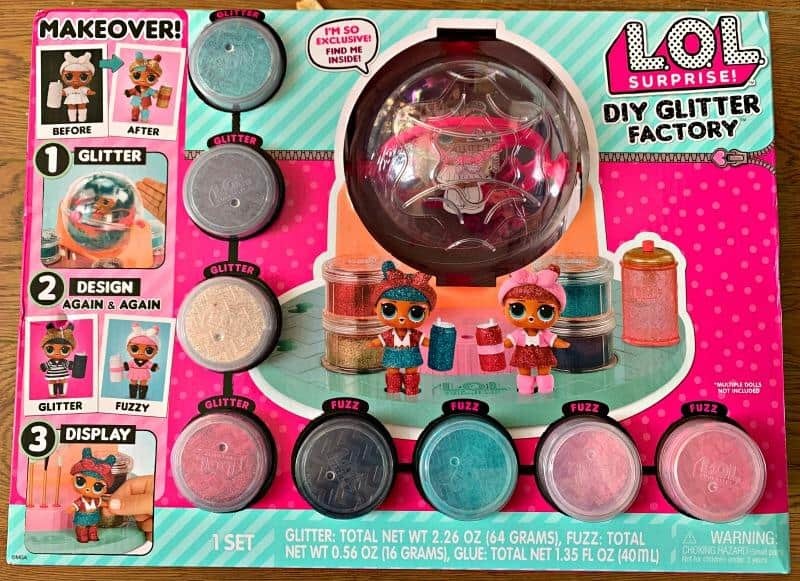 I would like to win the set for my niece. I’d love it as I still have all my old Sylvanian Family sets from 30 years ago! I’d add it to the collection which my young son now loves playing with. My daughter Scarlett loves these cuties! It develops her imagination and sense of play. This would be a wonderful addition to her collection! My daughter has just got into these and they would be perfect as a first collection. I always wanted a Sylvanian family and I’d love to play this with my son. little lady loves to role play all the time! My Granddaughters both love Sylvanain Families and Cats especially gingers as we have 2 real ones. I would love to win this for my daughter she loves cats but can’t have one as my wife has severe allergies. Would love to get her in to the Sylvanian Families as thye have been a fantastic toy since I was young. I would love to win it for my daughter who is beginning to get into these toys and this would be a wonderful one to start with. I *love* Sylvanian Families and I can’t wait until my daughter is old enough to enjoy them too! I would give it to my niece. And it means i get to play with something I love as well as her! I’d like to win it for pure nostalgia, I’d then pass it on to my mother who likes cats. I’m a grown up and I still find them captivating. I’d love to win as a present for my 7 year old niece. I would pass them to my children as they’re big fans of the collection. I’d like to win them for my grandchildrens collection. I’d love this for my daughter, great gift for her before her baby brother turns up. I’d love to win the maple cat family because they are so cute. I’d give them to by best friend, who collect them. My daughter has just recently just started to like sylvanian families so it would be lovely to surprise her. My daughter would really deserve and appreciate this prize. She has worked so hard at school and been super helpful to me. She doesn’t have anything from the Sylvanian Family although she always likes the play sets when we go shopping or watches adverts! I’d love to win this for my great niece. Sylvanian Families are her favourite toys. I’d love to give it to my daughter. She adores these toys and they’d be a great addition to her collection! I would give this to my daughter, Autumn 4, I would love to win because she wqould be delighted to receive this. I would give it to my 7 year old daughter, she would love them! I would love to win this for my twin nieces who love Sylvanian Families and cats! I would love to win for my gorgeous great-niece, Mia, who is crazy about Sylvanian Families. I would love to win this set because it would make a great gift for my granddaughter! I would love to win it for my daughter, she is crazy about cats! I’d love to win this for my friends granddaughter, she loves Sylvania families! I loved playing with and collecting Sylvanian families when I was younger and I’d love these for my daughter so she could start her own collection. My daughter would love this because she is 4 and car mad! I loved Sylvanian when I was younger! My little girl is a huge fan now so if I was lucky enough to win I’d give them to her ? I would love to win this for my daughters, I loved my Sylvanian families, would be brilliant to relive those memories with my daughters. I’d love to win this so I could give it to my Goddaughter. She loves Sylvanian Families. I remember these from when I was a kid so it always brings back fun memories. I’d love to win this for my daughter whose a huge sylvanians fan and always looking to add to her collection. We regularly visit the sylvanians shop in London to add special bits to her collection. My daughter Mariella would love some Sylvanian families for her tenth birthday to go with her other little set ups on her desk. My daughter is Sylvanian Families OBSESSED! She’s always telling me which Sylvanian family or building she’d love to get next. The Maple Cat family is on her wish list, right after the Grand Department Store. I owuld give this to my niece whi is obsessed with Sylvanian families. That’s all she has on her birthday list. I would give these to my young son, he loves cats! I’d love to win this because I remember having Sylvanian Families when I was small and I know Daisy (who is 7) would love them. Not just because I loved them – but because she’s mad about cats too! 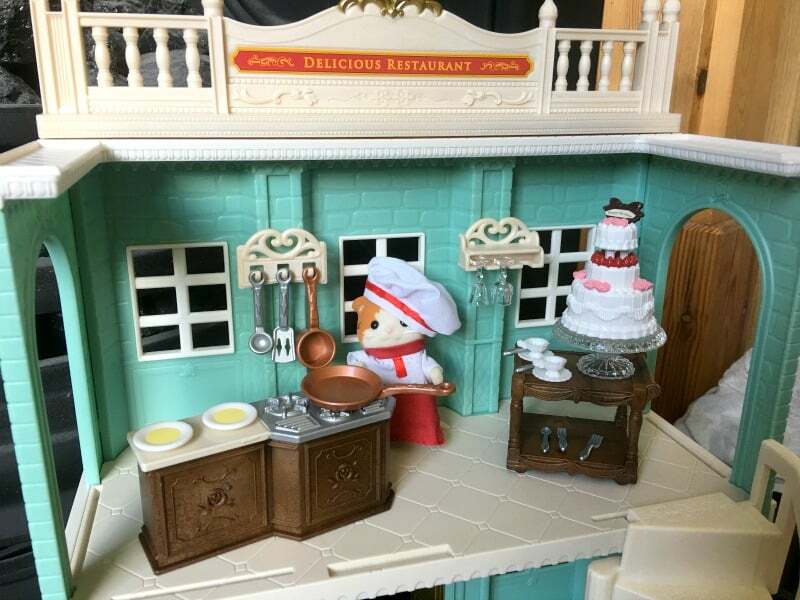 My niece collects Sylvanian Families and has the hotel and she would love this set. My daughter would love this, she loves cats and Sylvanian Families!! 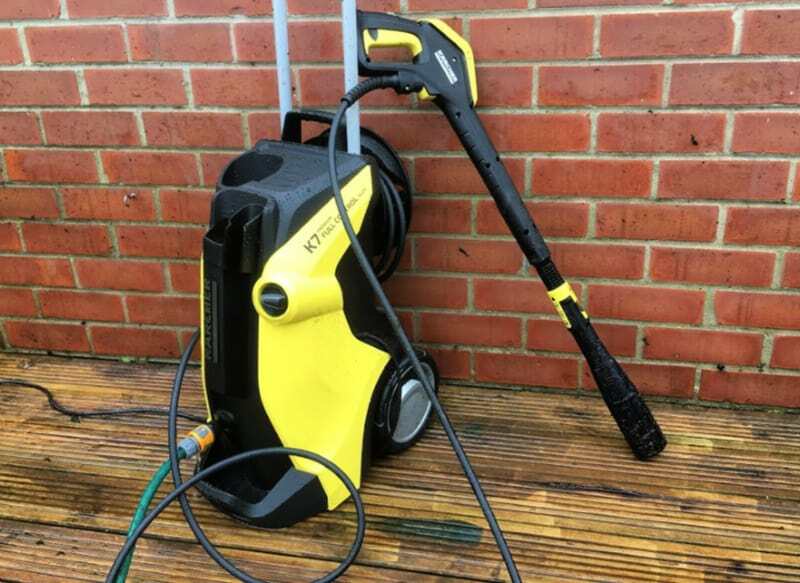 Be great to win as a first set for twins Rose and Teresa who would love as much as I do! I would love to win this for my niece who collects Sylvanian Families products. My girl will adore these. If I won this prize I would give it to my little girl Emily who is 4. She would love Sylvanian families as she loves playing make believe with her dolls and dolls house, and would think they are very cute! I’d love to win this for my daughter. She loves Sylvanian families. My Daughter absolutely adores these and has been collecting them and so I would love to win this for her. My granddaughter is new to The Sylvanian families. She’s only three. She would adore this. They are adorable! My daughter has the Cosy Cottage, Boutique and Secret Island Playhouse but no full family sets yet. She’d love this! 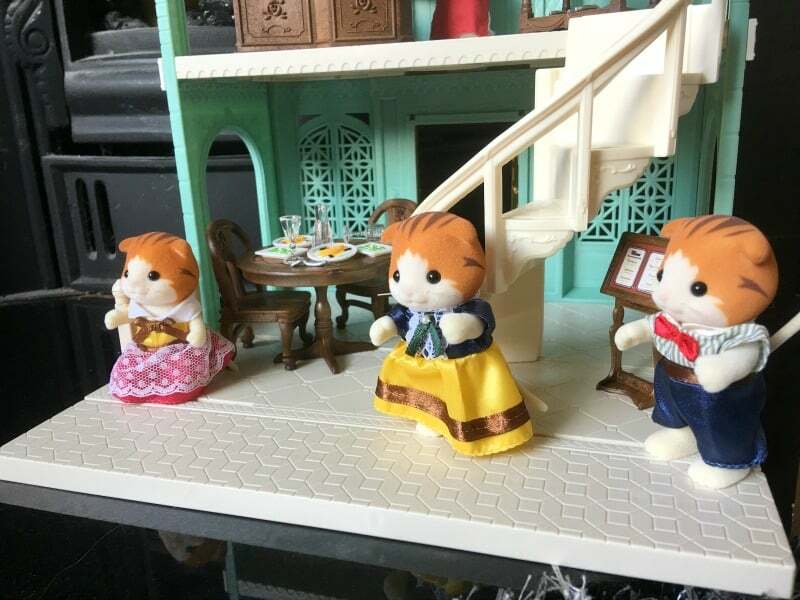 My two daughters have just discovered Sylvanian families and they would love to add this family to their collection! this would make a lovely present for my little niece. I would give this to my niece, she loves cats! Nice prize for any little one. Especially a baby girl! Too cute.